I made yogurt. Yep. All by myself. Awhile ago I heard about someone who made their own yogurt and have been dying to try it ever since. I looked up recipes and combined a few to come up with one that worked for me. Basically you heat up milk, let it cool, add a bit of store-bought yogurt to get the active cultures going, and then let it sit in a warm place for several hours. I found a couple of sites helpful. You can find them here and here. 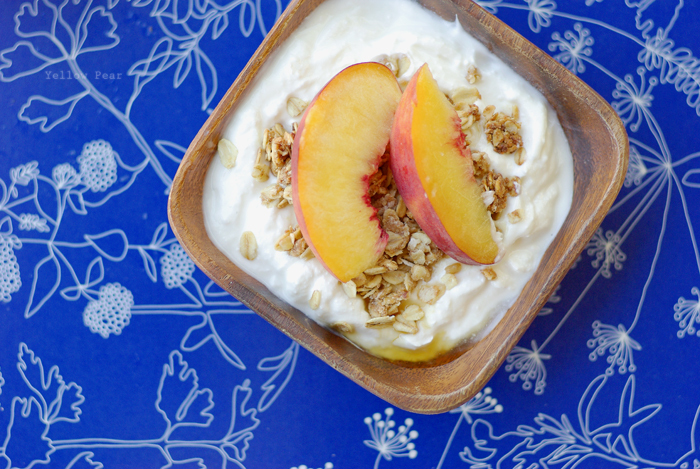 There are a few different ways you can keep your yogurt warm. The easiest seems to be to leave the mixture in your oven with only the oven light on. I however, have no oven light at the moment, so I opted for the heating pad route. Sounds totally strange, I know. And my friends raised their eyebrows and gave me weirdo looks when I said I wanted to try it. But. It turned out so good and it's just so darn cool to make your own yogurt that it's worth the raised eyebrows and stunned silence. You can also turn it into Greek yogurt by simply straining off the whey in a cheesecloth-lined colander for a few hours. Remember though, this is plain yogurt so it is tart. It's not the dessert-like grocery store variety with every sort of flavorful and sugary combination thinkable. But with a little drizzle of maple syrup, or honey and some fresh fruit and/or granola...you're good to go. In the end you have homemade yogurt that makes you feel really domestic and self-sufficient and just plain cool...and it's cheaper by far, which only adds to the wondrous feelings of superwoman. Did I tell you I made the granola too? I've been on a kick lately. I'm tired of all the added sugars in everything. So. I've made granola, fruit leather, yogurt and bread. Plus the kids and I have made lots of jam and bottled some peaches. I don't think the kids are as jazzed about it as I am. Mr. C told me yesterday that he has never, EVER in his WHOLE entire life tried Cocoa Puffs. Poor guy. The trials he has to endure. Sounds interesting and I think I just might have to try it! Great Job!! Making yogurt is fun, and you can do it with or without a yogurt maker. I prefer to use a yogurt maker and I use the Euro Cuisine model. It is inexpensive and has performed exceptionally well for as long as I've owned it.